Salt marshes forms in coastal areas that already have mud flats.They usually form in areas that are well sheltered, such as creeks, inlets and estuaries where fine sediments can be deposited. They also form behind spits and artificial sea defences where tidal waters can flow gently and deposit fine sediments. 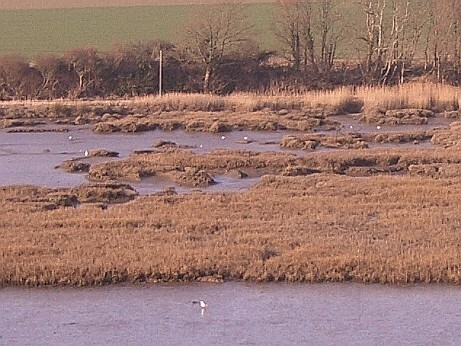 Salt marshes are exposed at low tide and at least partially flooded at high tide, so only salt resistant forms of vegetation can grow there. They are typically very flat, with numerous muddy channels and creeks cutting through them, making them very dangerous places to be as the tide comes in. In this picture you can see a well established salt marsh in the Tamar Estuary near Plymouth,Devon. The land is flat, muddy and is covered by the rising tide twice every day. The daily flooding means that the soil never dries out and thus remains muddy and sticky. The tide rises gently, bringing sediment into the marsh and depositing it before the tide goes out again. 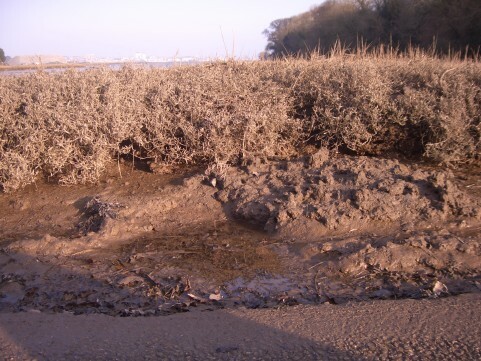 In some areas salt marshes are left as natural coastal defences because they can be safely flooded by high tides and thus protect the more valuable commercial, housing or agricultural areas lying further inland. Salt marshes can be reclaimed as agricultural land, as happened in Norfolk, but they are also very important in their natural state. They form a specialised ecosystem supporting numerous species of insects, birds and plants, as well as shell fish, and invertebrates such as lug worms. Human use of salt marsh areas varies but can include tourism in areas designated as nature reserves, bait collecting areas for fishermen, and they also provide ideal conditions for the farming of some species of shellfish. Hundreds of young shellfish are placed in large sacks that allow the water to flow through whilst stopping the creatures from wandering off. The sacks are pegged out on the mud and left for a year or two until the creatures have grown to a marketable size.